More and more game developers are not only pushing for diversity in the workforce but for more diverse representation within games. This year's crop of games at E3 is a positive step in that direction, but there's plenty of work to do, says Feminist Frequency. 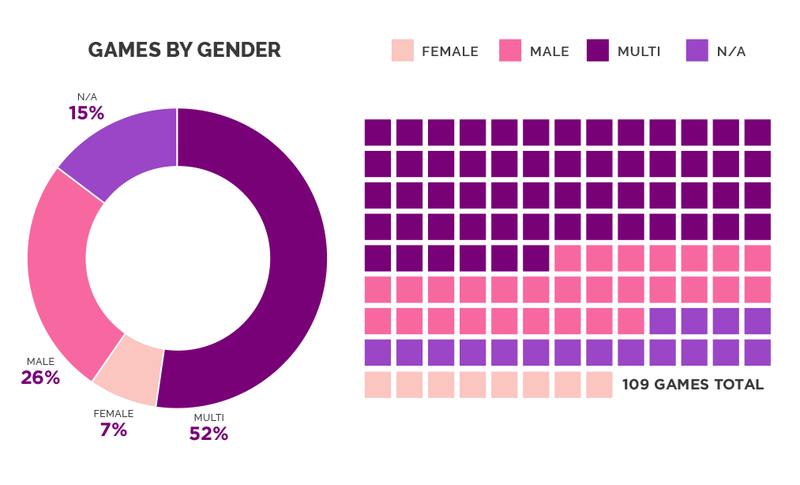 The organization published its third annual gender breakdown of the games on display at the major press conferences, and the findings show that over half (58 out of 109) of the titles shown allow for multi-gender options or for players to create their own character. "We appreciate and commend those games that featured female characters and players in their E3 demos. Anthem, for instance, is a game in which players can determine the gender of their character, but the demo centered on a female character and female player. Presentations like this help to normalize the presence of women in both online and physical gaming spaces. "Compared to last year, in which 12 times as many games featured male characters as featured female heroes, this would be a very good year. But the very fact that a year in which the number of games featuring men only outstrips those featuring women by a factor of 3 ½ instead of a factor of 12 qualifies as a 'good year' is itself tremendously damning, revealing that there is still so far to go before we come anywhere close to achieving gender equity in gaming representations." It's worth noting that the work Feminist Frequency has been doing is having an impact on game developers. In fact, Arkane's co-creative director Harvey Smith, explained in an interview with Engadget (via Polygon) that the reason Emily Kaldwin was playable in Dishonored 2 was that the team listened to the criticism about gender. "At first you take some criticism and you go, 'Wait a minute,' and then you go look and it's like, 'Wow, every woman in Dishonored 1 is either a servant, a prostitute, a witch, a queen or a little girl,'" Smith said. "Or a mistress. We had a mistress. That was not our intention. "When something like that pops up, you can get defensive if you want, or you can say, 'Guys, let me just ask this: Did we mean that?' And the answer is no, we did not mean that." Aside from gender, Feminist Frequency also took a look at the content and gameplay mechanics driving most games at E3. If the medium of games is to mature and take the art form to the next level, it can't rely solely on violence. And yet, Feminist Frequency's findings show that 80% of the games featured during the E3 briefings utilized combat or violence as the main mechanic. Petit adds, "As with our numbers on gender, it's important to understand that this data isn't meant to suggest that every game that employs combat mechanics is bad, or that every game that doesn't will be good. Additionally, we are in no way equating all games that employ violent mechanics with each other; the data isn't intended to suggest that the colorful sword-swinging of Tunic is the equivalent of the brutal beheadings we may see in a game like Middle-Earth: Shadow of War. Rather, we present the data to call attention to how prevalent violence remains in games of all kinds, because when violence is so consistently seen as a core component of game design, it limits our sense of what games are capable of and what kinds of stories they can tell."